When one considers R.J. Russell's upbringing, education, and early interests, it is somewhat surprising that today he is remembered mainly for his floodplain and coastal research. Richard Joel Russell was born in California in 1895 and, although he spent part of his youth (between the ages of four and eight) in Hawaii, his grade school and high school training took place at the foot of the Coastal Range in Hayward, California. He had plenty of opportunity to look west at the Hayward mudflats (some of which were in Russellville, a town on San Francisco Bay named after his grandfather), but instead headed for the hills and mountains every chance he had. His high school training included a course in physical geography which used a textbook by Wm. Morris Davis, thus he was indoctrinated early with the Davisian approach to landscape development. He was precocious--learning to type at nine, photographing the San Francisco earthquake (1906) at 11, publishing an article on the printing of color photographs at 17, and winning an automobile race (60 m.p.h.) at 19. He loved hiking, horses, and mountains and, when it came time to decide on a career, chose forestry, which could combine all three of those outdoor activities. With this interest in mind he enrolled at the University of California-Berkeley in the College of geology and obtained his first degree in vertebrate paleontology. While working on his doctorate, Russell spent four summers studying the structure and stratigraphy of the Warner Range in northeastern California. He was destined to become a structural geologist and indeed several of his earliest papers fit into that category. However, during that same period of time, Russell taught in Carl O. Sauer's geography department, went into the field with Wm. M. Davis, and began research in climatology. In 1926, the year he received his doctorate, Russell joined Texas Tech as an Associate Professor. Because of Russell's training, Texas Tech was probably a more logical place for him than Louisiana State University, but when his old colleague and friend, Henry Howe, asked him to join him in developing a strong, broad-based School at LSU, Russell readily accepted. With a very catholic view toward science, Russell enjoyed teaching a variety of courses. Further, he especially relished field work, an endeavor that became a hallmark of the School and an activity which Russell engaged in until the last year of his life (1971). Russell remarked that coming to Louisiana was a physiographic shock. The Mississippi floodplain was a form he had not thought about except as an example of Davis' "old age," which, as he noted later, "is a misnomer because the Mississippi floodplain is among the youngest of all landforms." The shock soon wore off and Russell immersed himself in low-lying, wet-land environmental research. During his first 28 out of 43 years at LSU, he concentrated on alluvial morphology, the Quaternary Period, sea-level change, and deltaic physiography. These studies established Russell as a leader among students of rivers, floodplains, and deltas throughout the middle five decades of the 20th century. Russell wrote that when he discovered that alluvial morphology is an exciting field of research he discovered "a new way of life!" Russell's (1933) first Louisiana paper, "Larto Lake, an Old Mississippi River Channel," led to his classic volume, "Physiography of the Lower Mississippi River Delta" (1936). 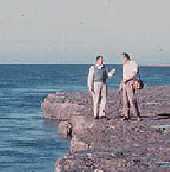 In it, he discussed load-induced subsidence and, with H. Howe, the Gulf Coast geosyncline. In that volume Russell also discussed the rapid rate of coastal retreat in Louisiana, a retreat that, based on many of the articles published today, is considered a "recent discovery." In those early days Russell expanded his base and included research on other rivers, such as the Rhone in France and the Meander in Turkey. Much of Russell's early research was concerned with deltas. However, in Russell's mind at the time, they were not so much a coastal feature as an extension of a river floodplain. It was not until Russell turned 60 that he seriously turned to coastal research. He thought it was time for a change and so "embarked on ... the investigation of possible relationships between mineral composition and beach morphology." He selected the Lesser Antilles as the location to begin his studies because they possess volcanic, organic, and quartz-sand beaches. On his way to the International Geographical Congress in Brazil in 1956 he stopped at six of the area's islands. On St. Lucia, he was introduced to beach rock by two colleagues. Not being one to pass up an interesting challenge, Russell delved into the study of beach rock, which was to occupy much of his research time for the next seven years. During that seven years Russell, often with Wm. G. McIntire, visited many of the West Indians islands, Hawaii, Fiji, Cocos Keeling, Mauritius, New Zealand, Australia, South Africa, and those Mediterranean coasts where beach rock is present. He wrote at least eight papers on the subject and in most them the importance of the water table on beach-rock formation was emphasized. Indeed, he was still researching the importance of the water table on coastal development at the time of his death--his last paper, "Water-Table Effects on Sea Coasts" (1971) was published posthumously. Although most of Russell's coastal work was with sandy beaches he did study to some extent fine-grained beaches and cliffy coasts. One of his premises was that "any morphological feature associated directly with an existing sea level must have originated in an amazingly short time," an idea he used in connection with his paper "Recent Recession of Tropical Cliffy Coasts," which was published in Science. Because of his cliffy-coast research, Russell argued for a relatively stable still-stand sea level for the past 10,000 years. He was also interested in Quaternary sea levels and in that connection studied elevated notches, especially in Oahu and Jamaica. A logical extension of Russell's interest in beach rock was the study of algal and coral flats. In his tropical travels he noted many locations where algae coated coastal rocks of different types. An advocate of precise, terminology, Russell thought the term coral reef should be limited to those reefs where corals are in the same relative positions they had when alive and that a reef flat is composed of fragmental reef debris and is normally found landward of the active reef. Although most people will remember R.J. Russell for his research, especially riverine and coastal, there are some other characteristics that should be noted. He was an administrator (Dean of the Graduate School at LSU for 12 years), he was an organizer (creating Coastal Studies Institute in 1954), he was a leader (becoming president of both the Association of American Geographers  and the Geological Society of America ), and he was frequently honored (becoming a member of the National Academy of Sciences  and a recipient of numerous other honors). Russell, first and foremost, was a scientist. He wrote that a "scientist is motivated by curiosity." He enjoyed discovering facts, speculating about their meanings, drawing conclusions, and publishing the results. He believed that scientists have an obligation to share their ideas and subject them to scrutiny and evaluation. To his students and colleagues he said "go into the field with enthusiasm" and study some of the many interesting features that are so abundant in all environments. For many of us the coast is the logical place to continue our efforts "with enthusiasm."